AN exciting out-of-the-box event is open to local businesses this coming Monday (12 November) at the new Downshire Civic Centre. T0 Breakout and Breakthrough your business limitations to grasp wider opportunities or improve performance, start by attending this free lunchtime event which will introduce the idea of collaboration between businesses for win-win results, helping you to explore whether there really is strength in numbers and if working with others could help you to achieve more and grasp new business opportunities. improve productivity and staff development, and help significantly speed up new product development and innovation. In turbulent markets and changing technology collaboration could be a real help for smaller businesses trying to stay competitive. 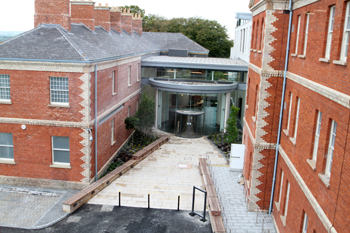 The new Downshire Civic Centre. Times:12:00 – 14:00pm (a lunchtime event). This is a valuable opportunity to take time to consider whether collaboration could offer new possibilities to your business, for growth, to cut costs, or for diversifying into new areas. It will give you a head start in considering support opportunities Beyond will be providing for collaborative projects. Audience: Who should attend this event? The session will use three valuable individual and group exercises to help participants think about how collaboration might really work for them. It will also provide short presentations on what collaboration is, how to look for opportunities, and how to avoid the pitfalls. Speaker: Nick Mack of Creative Edge will be facilitating the event. Nick is a keen advocate of collaboration. He has gathered a wide ranging insight and experience in the possibilities of collaboration within the private, statutory and community sectors. He has designed development and health check tools to help partnerships form and work well together locally and internationally, and promoted the opportunities of collaboration in rural development, sustainable development and innovation. He has assisted a number of organisations and initiatives to find better ways of working together to solve problems and achieve better outcomes. Light lunch provided at this event.